A rant about books, horror, and the weird. I sometimes take on my love/hate relationship with goodreads and Amazon. I probably have rated it higher than it should be but it was quite thought provoking. Not so much another dissection of the trial that seemed to never end as the rampant online fury that surrounded Amanda and Raffaele, people that not only were blatantly innocent but who these people couldn't have possibly known anything about other than what was fed to them via social networks, websites, and overtly biased media outlets. What possible stake could Jim Bob in Timbuktu have in the sad tale of one British student's brutal murder in Perugia, Italy and the quite obviously framed defendants? Why wish the innocent guilty, and so vehemently, or care at all with everything else that is going on in the world? 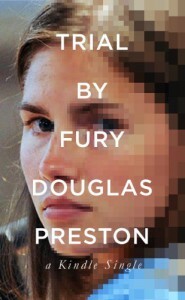 Preston, yes that Douglas Preston of Preston & Child, does a good job of distilling the workings and psychology of online mob hysteria and retribution and how it starts and spreads virally. He focuses not so much on the details of this actual event as on the meta-level workings of the frenzy and how literally thousands of individuals can make death threats against someone they don't know and don't have any stake in based purely on mob dynamics and biological and social evolution.